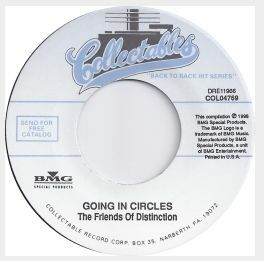 The Friends Of Distinction were a soul group from southern California that formed in 1968 around Harry Elston, Floyd Butler, Jessica Cleaves and Barbara Jean Love. Elston and Butler were members of The Hif-Fi’s, who warmed up for Ray Charles on tour, along with Marilyn McCoo and Lamont McLemore who went on to form The 5th Dimension. The group secured a recording contract with RCA Records after joining forces with ex-Cleveland Browns running back Jim Brown who took on management of the group. When Elston heard Masekela’s hit version of the song, he wrote lyrics to it for Friends Of Distinction to record. Their version hit #3 on the pop charts and #5 R&B. 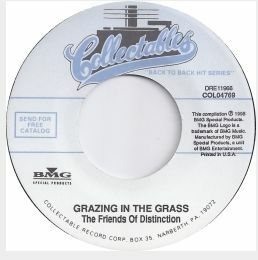 While many people believe that the song is about getting high, it’s actually about bulls grazing in the grass. The song has been covered by Stevie Wonder, Chet Atkins, Boney James and Meco, and has been featured in many films including Anchorman: The Legend of Ron Burgundy, Jackie Brown, I Shot Andy Warhol and I’m Gonna Get You Sucka. 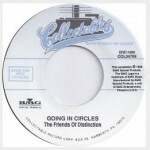 The flip of today’s single is The Friends’ follow-up single “Going In Circles” which was also a million seller that climbed to #3 on the R&B charts and #15 pop in 1970. The slow jam heartbreak/coming-of-age song was written by Jerry Peters and Anita Poree and has been covered by The Gap Band, Isaac Hayes (on his Black Moses album) and Luther Vandross. The story goes that after six albums and five years of hits including “Love or Let Me Be Lonely,” “Time Waits for No One,” and “I Need You,” The Friends Of Distinction broke up somewhat acrimoniously with Elston and Butler going separate ways to work outside of the music industry. By 1990 the legacy and influence of The Friends’ recordings had grown substantially. After not speaking to each other for many years, Elston and Butler agreed to work together again, however the reunion was short lived as Butler suffered from a heart attack and died in Elston’s arms. Elston reformed the group in 1996 with new members including Geno Henderson, Wendy Brune and Berlando Drake. They continue to tour and perform the music of The Friends Of Distinction around the world today.